Sew Much More is an exclusive Premier, Horn of America® Cabinet dealer. We carry the full line of Horn of America® cabinets. We have a large selection available on our showroom floor. Stop in to see and touch the High Quality of these beautiful cabinets. Horn Cabinets are "Made in America" and come with a Limited Life -Time Warranty. There is a wide variety of styles, colors, and finishes available. 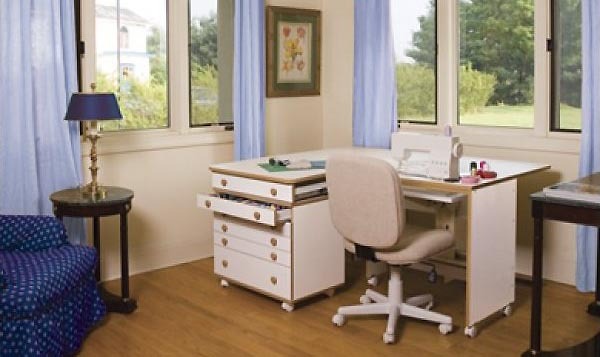 Horn of America also makes the best line of Adjustable Sewing Chairs, designed for your comfort while sewing, and they come in 4 colors. Each month there will be 1 cabinet selected as "Cabinet of the Month" for EXTRA Discount Savings.